Within the frames of the European project IMPEx scientific groups from Russia (represented by SINP scientists), Finland, France and Austria develop an interactive run-time environment including databases and a number of computer models for the studies of the Solar system planets. IMPEx is an Integrated Medium for Planetary Exploration. From 2015 it will be possible to gain an access to this system through IMPEx web-portal. The system will provide data on the planets' magnetic field and plasma, obtained by space experiments and calculated by means of computer models. Besides, there will be descriptions of the data, spacecrafts and computer simulations of the space objects and phenomena. 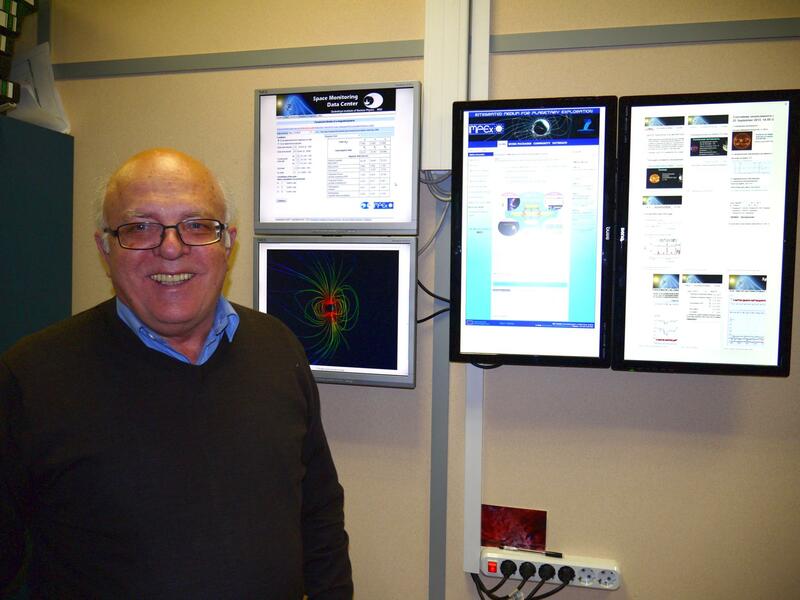 The Head of the Laboratory of Planets' Magnetospheres, DSc. Igor Alexeev told us about the participation of SINP scientists in the IMPEx project. - Igor, how did it happen that SINP became a participant of the IMPEx project? - We were invited to the project, because during a very long time, approximately from 1971, we work with analytical models of planets' magnetospheres. It is very specific, not very popular field of activity. There are a few groups in the world which concern these models, because pepople prefer to work with direct data, i.e. with data obtained by the experiments onboard spacecrafts, or with kinetic models. There are about 100-300 participants, who work directly with the planets' magnetic fields. And our colleagues, with whom we have carried out joint studies, invited us to take part in the project, because they knew about out experience in this field. - Are there plans to invite any other groups to the IMPEx project? - Unlikely it will be a large collaboration. We can solve all the problems in a present set of scientific groups. - Please, tell us about the input of each group into the project. - An international research team consists of four groups: Austrian, French, Finnish and Russian. The last one is represented by us, SINP scientists. We are specialized in the development of the analytical models of the magnetic fields in the vicinity of the following planets: Earth, Mercury, Jupiter and Saturn. Of all the Solar system planets these ones have the most powerful magnetic fields. Finnish group is specialized in the numeric simulation by means of hybrid and magnetic-hydrodynamical (MHD) models. Hybrid models, as the name implies, are a cross between kinetic and MHD models. They are used for description of ions and electrons. French group on the instructions of the National Center for Scientific Research (CNRS) collect and store the data obtained by European and American space experiments. Currently their database consists of the data from several dozens of space missions and includes 10-15 physical parameters, such as, for instance, density, velocity, value of the magnetic field, electric field value, plasma flux, high-energy particles flux. Austrian group coordinates the project and develops interactive IMPEx web-portal, organizes interaction between the scientific groups in order to consolidate our analytical model, hybrid models of the Finnish group and French database. As a result, the researcher, who studies the problems of the magnetosphere or the plasmasphere of the planet, will not need to send a request to a number of databases, and then to collect and analyse obtained separated responses. He will have an opportunity to get in the IMPEx web-site and very quickly, during several minutes, get all information he needs. - Please, exemplify your words. - Without understanding neigther paraboloid model, nor hybrid model, and having only a general idea of the ions and electrons behaviour the user will get necessary information and will be able to work with it. For instance, the researcher wants to analyze conditions in the Mercury magnetosphere. He will get the model of the magnetic field and will know the predictions by the model on the IMPEx site. Then he will take the experimental data of the magnetometer from the American spacecraft "Messenger", compare them with the model, make his own conclusions and write a scientific paper. Or, the researcher is interested in Jupiter. Currently a space mission to its satellite Ganymede is being developed. Maybe, someone will wish to calculate magnetic field along the trajectory of the spacecraft. Such calculations will be possible in the IMPEx medium by means of our models. - What other problems can be solved by IMPEx? - The system can be used not only for the analysis of the planetary databases, but also for missions development. It's possible to simulate a scientific instrument for a spacecraft. IMPEx system will allow development of a computer simulation of the planet's surrounding space, launching of a virtual spacecraft, obtaining virtual data from virtual instruments onboard it. It will be possible to answer the questions: will the mission meet its targets and what specific characteristics of the instruments will be necessary for it. - What spacecrafts will provide data about the planets? - "Mariner-10", operated from 1974, "Galileo", operated during 8 years near Jupiter, "Kassini", still operated near Saturn, "Messenger", spacecraft near Mercury, and the near-Earth spacecrafts - "Themis" and "Cluster". - Will the access be free? - Surely. There will be on-site registration for safety reasons. All data will be open. And one more very important moment: the code will be closed, i.e. the user will be able to run the program, but not to download it. - What is the current status of the project? - Now we develop web-service for the final product (IMPEx web-portal) development. In order to provide access to the data from different sources, it's necessary to link them. This problem supposes existence of the single standard, so-called Data Model, for data description (computer simulations and real measurements) and corresponding protocols for information transfer via web-service. The main actions during the data processing are the following. We take data array, for instance, density and speed. Then develop a program, which processes this array in order to get a graph to be compared by user with some other data or for calculations of some parameters. Then it is possible to develop an analyzing program, which will allow graphical desription for convinient analysis. Besides, the French group develops visualisation methods. One of the positive moments is that we use very advanced methods, as teleconferences. Every month we have it during 2 hours. If the project is successfully finished, in two years the IMPEx web-portal will be opened for the users. Besides, our developers, in particular, IMPEx Data Model, will be included into the international protocol SPASE for operation of space missions data, because we'll conform its standards. SPASE is a large international collaboration coordinating operation of databass within the field of space reasearch.